Approach the weir at 90˚. Be aware that if the water level is low, you may not get all the way down the weir. The front paddler must then jump out quickly to prevent the boat from sliding sideways. If the back paddler jumps out, you run the risk of the boat spinning sideways. If you shot the weir extreme left, drop straight back into the flowing channel and paddle away. 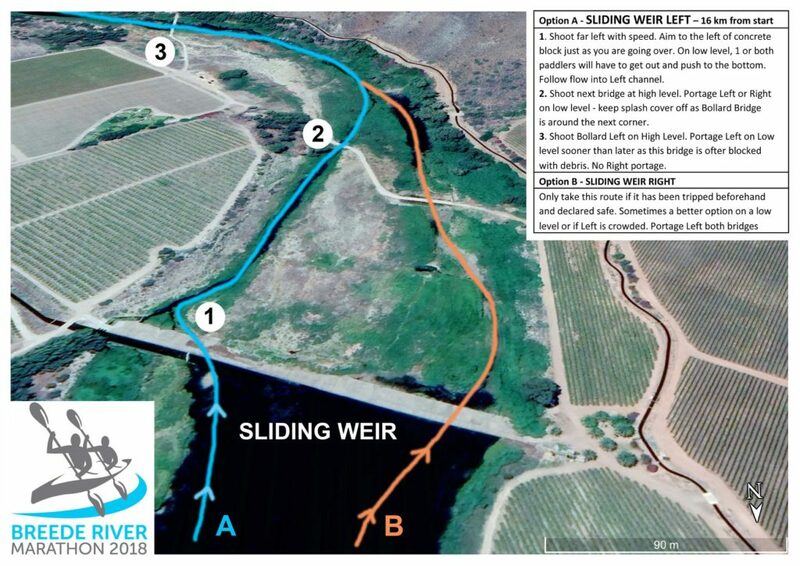 If you shot the weir left of centre, paddle straight ahead and look for a gap in the reeds on the left to steer the boat back into the flowing channel down the left bank. Follow the flow for about 300m to the next low level bridge. On a high water level this bridge can be shot over the top. On a low level this bridge will be portaged left or right. You will not be able to go under the bridge on a low level. Once over the weir paddle away to the next low level bridge which is 100m downstream. If the water is high this bridge can be shot anywhere. If the water is extremely low, you can paddle under the bridge (please pay attention to the race briefing for instructions on where to shoot it at this level). On a medium level the bridge will be portaged right or left (left better option).